ClampArt is pleased to announce “Teenage Lust,” an exhibition of photographs by legendary photographer, Larry Clark, from his second monograph published in 1983. 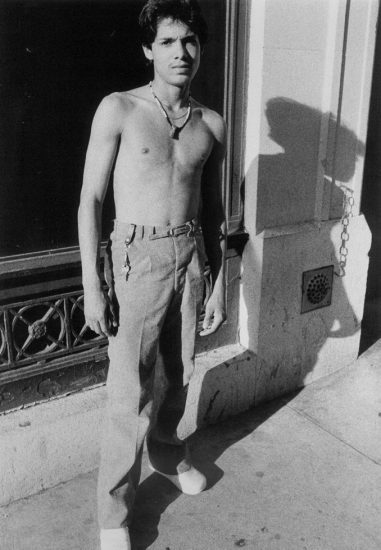 Larry Clark first made a name for himself when he revolutionized documentary photography in his classic book, Tulsa, released in 1971, in which he presented straightforward, autobiographical images of violence, drug use, and adolescent sexuality. While Tulsa earned Clark a grant from the National Endowment for the Arts for use toward his next project, that work was delayed over a decade by the artist’s heroin addiction and a stretch in Oklahoma’s McAlester Penitentiary. 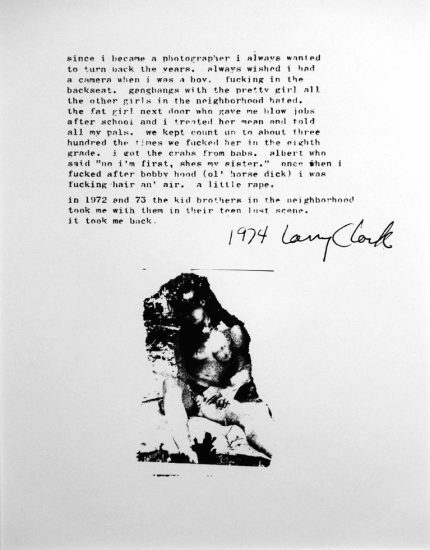 Eventually, Clark completed his second and equally innovative body of work, in which he largely shifted his focus from drug culture to sexual obsession. The artworks of Clark’s entire oeuvre (including the photographs from Tulsa and Teenage Lust, in addition to later films – notably “Kids,” 1995), address the challenges of adolescence in a culture that both idealizes and violently commodifies its youth. Clark’s intimate and shockingly candid work influenced an entire generation of subsequent artists, including Nan Goldin and David Wojnarowicz, among many others. ClampArt’s exhibition of photographs from Teenage Lust coincides with a long-awaited survey of the artist’s work to be mounted by the International Center for Photography in New York City.